Abbey Wood station is a recent development delivered by Network Rail as part of the Crossrail Project. 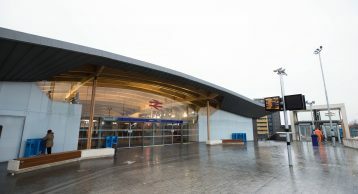 The striking new station building, and concourse marks the start of the transformation of transport links from Abbey Wood to travel right through central London to Paddington. 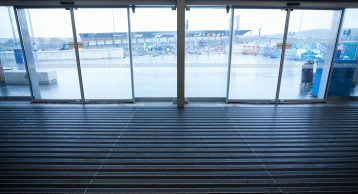 Find out how installing Heavy Duty Entrance Matting will help maintain safety and keep cleaning costs down. 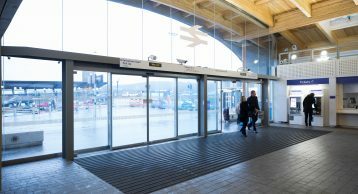 The temporary station at Abbey Wood which opened in 2014 kept passengers moving while the work progressed. After 4 years of construction the immediate benefits it will bring to the local community are huge. 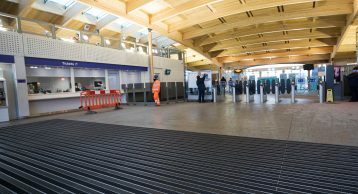 The opening of the new ticket hall and concourse is a further milestone for Crossrail project and brings the infrastructure one step closer to the introduction of the Elizabeth Line service in December where Abbey Wood will be one of ten stations on this line. Entrance Matting therefore is a must to keep this expansion pushing forward. With the improved infrastructure Abbey Wood will become an even more desirable location for people to want to come and settle in. From December 2019, when the full route opens, an Elizabeth line service will run every five minutes and allow passengers to catch one train right through central London to Paddington, Heathrow or Reading in the west. 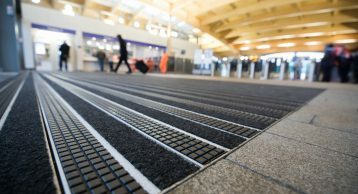 Keeping this influx of passenger safe is the job of INTRAsystems Entrance Matting System. 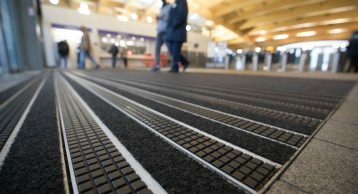 Specifically, the INTRAform DM Entrance Matting system with the highly durable FR insert to withstand all weather conditions, comply with all regulations and resist heavy to extreme foot/wheeled traffic. 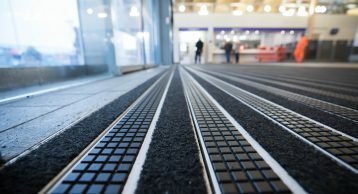 Combine this with polyamide sheet fibre you have a Entrance Matting system which has superior moisture absorption of 5.4l/m², Excellent fire-resistant capabilities all made from 33% recycled Econyl yarn for excellent environmental credentials. 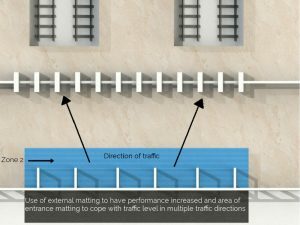 This was a highly recommended design of Entrance Matting with sufficient walk off areas to prevent the ingress of dirt and moisture into the station in the direction of traffic. 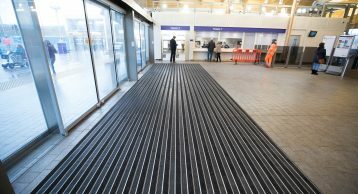 This is the optimum performing design of Entrance Matting as used in Abbey Wood Station which utilises the Zonal System to cope with traffic in multiple direction.